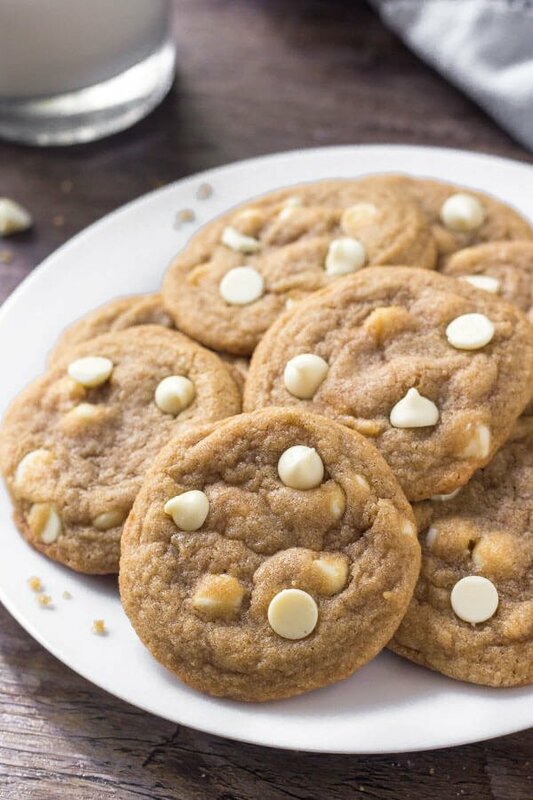 These white chocolate chip cookies are extra soft, super chewy, and filled with delicious white chocolate in every bite. Switch up your chocolate chip cookies by making this delicious white chocolate variety. Chocolate chip cookies are obviously a classic. But sometimes even a classic needs a revamp – and that’s why today we’re making these white chocolate chip cookies. They have a delicious buttery vanilla flavor, the softest chewiest texture around, and they’re seriously packed with white chocolate chips. If you love white chocolate – these white chocolate cookies are an obvious choice. But even if you typically opt for milk, semi-sweet or dark – I highly recommend giving these delicious morsels a try. Ok – so I know what you’re thinking. Can’t I just sub chocolate chips for white chocolate chips in my favorite cookie recipe? Well…. you could if you wanted to. However, white chocolate has a distinctly different flavor than milk chocolate or semi-sweet. It’s sweeter and obviously void of cocoa. Since the flavor is quintessentially different, I needed to make a different cookie recipe for white chocolate chips so that the balance of sweetness was still on point and that the cookies didn’t taste too rich. I also wanted them to be extra chewy & super soft. So – to get started we’re using a combination of butter and shortening. Cookies with butter have a lot more flavor, but cookies with shortening have that perfect soft and chewy texture. Using a combo of both, therefore, gives flavor and improves the chew factor. As well, because white chocolate is pretty rich already, you won’t miss the extra flavor from using entirely butter. There’s also a good amount of vanilla extract, and just enough salt to balance off the sweetness. What’s also incredible about these white chocolate chip cookies is that there’s no need to chill the dough. They stay thick enough without having to place the dough in the fridge first – so you can go from craving to cookies in no time. But if you prefer extra thick cookies, or are planning to use a large cookie scoop (dough balls about 3 tablespoons in size) I’d recommend chilling the dough for even 20 minutes. Can I use white chocolate chunks instead of chocolate chips? Go for it! Just make sure they aren’t too big, otherwise, they can cause cookie spreading. I don’t have cornstarch – what should I do? I’d add 1 more tablespoon of flour. They won’t be quite as soft, but still super delicious. Can I use 100% butter instead of some shortening too? You can… You’ll need to add some extra flour though. I’d use 2 3/4 cups all-purpose flour if you want to substitute the shortening for more butter. I want to make giant cookies, how long will they bake for? I made my cookies about 1- 1.5 tablespoons in size and they took 9-11 minutes to bake. For large cookies – say about 3 tablespoons in size – they’ll bake for about 13-16 minutes. My cookies spread and were too thin. What happened? Having butter that’s too soft or almost melted can cause this, or adding not quite enough flour. If you bake one tray and notice they’re spreading too thin, pop the cookie dough in the fridge to firm up. Or next time add 1-3 more tablespoons of flour. 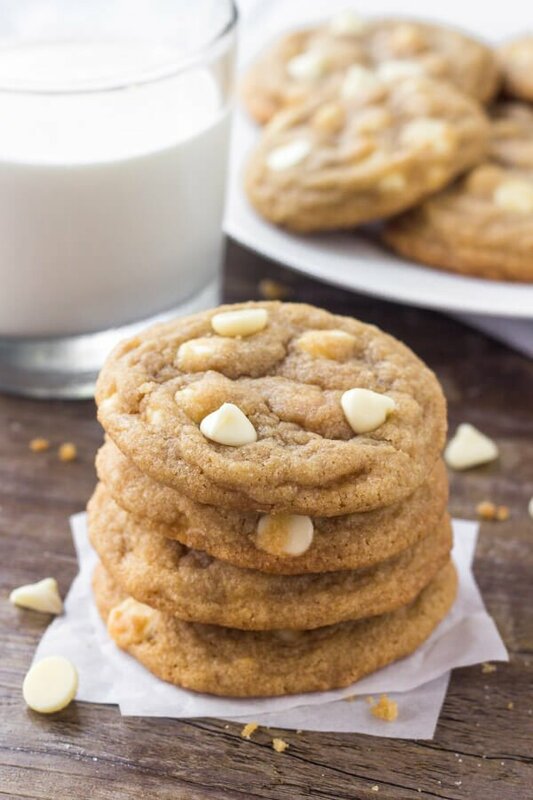 These white chocolate chip cookies are seriously chewy, have the perfect flavor to match all the delicious white chocolate, and are such a delicious way to switch up an old favorite. 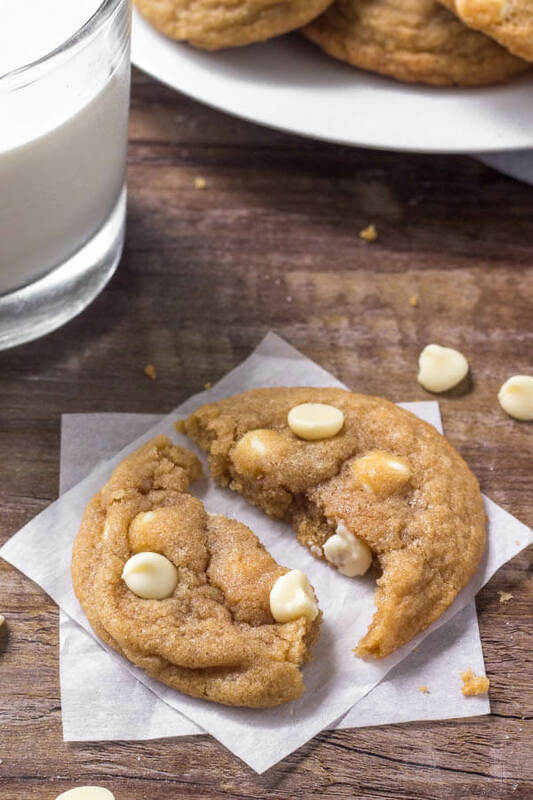 These white chocolate chip cookies are extra soft, super chewy, and filled with delicious white chocolate in every bite. Preheat the oven to 350F degrees. Line baking sheets with parchment paper or baking mats. In a large bowl beat together the butter, shortening, and sugars until fluffy (about 2 minutes). Beat in the vanilla and eggs. In a medium bowl whisk together the flour, cornstarch, baking soda & salt. Carefully beat the flour mixture into the butter about 1/2 at a time. I usually start with the mixer on low speed, then turn it up to medium as I go. 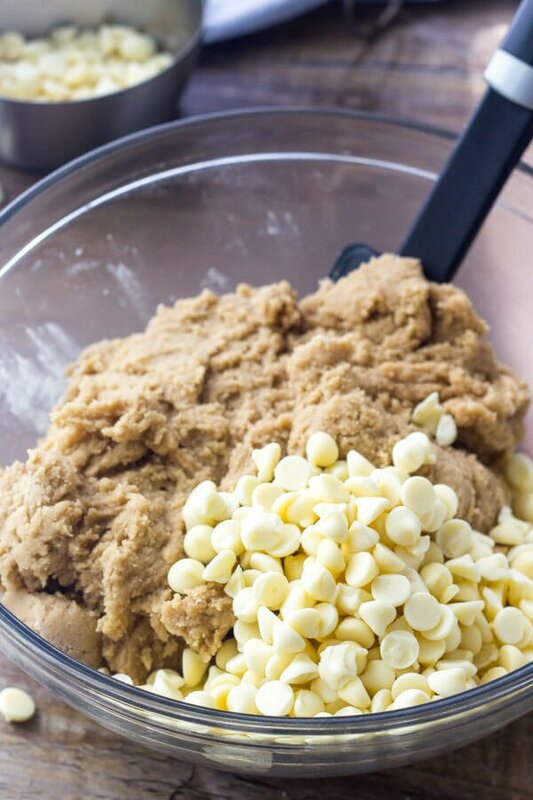 Turn off the mixer and stir in 1 1/2 cups white chocolate chips. Form the dough into balls about 1 to 1.5 tablespoons in size. Place 2 inches apart on the lined cookie sheets. Do not flatten. Bake one tray at a time on the middle rack for 9-11 minutes or until the tops look just set. Remove from the oven and dot the tops of each cookie with a few extra chocolate chips (optional). *Store cookies in an airtight container for up to 5 days. **How to Freeze Cookie Dough. Make the cookie dough and form it into balls. Place the balls in a ziploc bag and freeze for up to 2 months. Bake from frozen - they'll likely take about 1 extra minute to bake. 0 Response to "White Chocolate Chip Cookies"